Once upon a time there was a brand. That brand was part of the portfolio of huge package goods company. Its agency presented work to the company President. He loved the work. And then the work went into testing. The testing was part of their long standing procedures. The commercial tested well against the brand’s target audience which was very specific. However, the brand group wanted the work to test better against their secondary audience and forced the agency to change the work to accommodate their needs with the secondary (and tertiary) target. The agency was forced by the research to change the work. When the ads scored well against the new target, they went into production. The production took several months and literally cost millions of dollars. It was retested and did well against the secondary target, but scores dropped somewhat against the primary audience. Nevertheless, the brand group endorsed the work.. The finished commercial was presented to the President before its launch. When the President saw the finished commercial, he went ballistic. He wanted to know why the commercial changed from the original work he approved.. His brand group became sheepish; didn't really defend its actions. The Ad Manager explained his actions, but the President was displeased. The President authorized it to be re-shot with the originally approved storyboard. Again, at a cost of millions. The work went on air and is the best work in the category and continues to test well against the primary target audience. Consumers actually love the spot (I am presuming this includes the secondary audience). After the re-shoot, the advertising manager was fired for changing the work without telling the President. The agency removed the account management lead for not managing the process. The client is now happy. The agency is happy. And the brand group who forced the changes is just scratching its heads, but they are happy since their friends love the commercial. On May 13, the Advertising Business Insider published a list of the highest paid people in the business. God bless them all. The irony about this list is that, with the exception of the heads of some of the agencies, most are people not in the public eye. I actually didn't know the names of many of them. They are financial people, board members, even one lawyer. But they are very much in charge of the future of the business. I actually spoke to the president of the New York office of one of the largest agencies controlled by someone on this list. He had met one of the people on this list, who worked at the holding company of his agency, but was sure that this person would not really know who he is, despite running the biggest office in the network. That is simply stunning. Since most people reading this blog post will be working at companies which employ the majority of these people, everyone should click on the link to determine who these people are and how much they are making. Most of them received salary increases last year despite their companies not doing all that well. Executive compensation is determined by boards of directors which usually control a compensation committee. In reality, those committees – and board members – serve at the discretion of the board chairman. Now we all understand that the big guns like Martin Sorrell, Myles Nadal, John Wren and Maurice Levy and others are entitled to make a lot of money. I would guess that most of them work 24/7 and are on a plane too many days a year to count. These people should be paid well. Their salaries belie huge amounts of other compensation – limousines, planes, cars, luxury travel, private chefs and others. I don’t begrudge any of them anything. The financial executives on this list make staggering amounts of money. They are also the people who determine who can get a raise, a promotion and which agencies need to cut staff. These policies are dictated to to all their agencies. I suppose that is there job since almost all their companies are publicly traded and they must insure upward numbers for their shareholders. Many of these people o have nothing to do with the day-to-day business. What really bothers me is not that they are making so much money, but that they put themselves before their employees. The majority of their companies have salary and promotion freezes. It is hard to imagine someone making millions, but denying a lowly administrator a meager increase or a creative or account person who slaves for 80+ hours a week a promotion and a raise. I simply wish some of them would give back their million dollar raises so that their executives who serve them faithfully can get well deserved raises. As my mother used to say, “What’s good for the goose is good for the gander.” It is also good management policy. Many ad agencies and other companies offer employees incentives when they successfully refer a candidate who gets hired. These incentive payments range from a low of about $1,000-1,500 to as much as $3,500. I have heard of even higher. Companies added this incentive in order to partially alleviate the expense of recruitment fees and to encourage their employees to send them good people. The problem with this is that it encourages employees to make “placements” without regard to quality. It also encourage internal people like HR and hiring managers to let down their guard while interviewing and accept these referrals without due diligence - after all, the referring employee a good worker. I hear tales of woe from candidates all the time. I recently saw a young man who had been referred to an agency by an employee who he had once worked with. The referring account person barely knew the account person she referred, but she liked him. And she knew that if he went there she could get a nice bonus. At the same time, the HR department had many jobs to fill. Hiring this account executive cleared up one open job. Of course the account and the job turned out not to be as advertised. The account person was stuck and after fourteen months he resigned so he could spend full time looking for the right job. During those fourteen months, his client had three CMO's and he had two group heads and three account supervisors. Now I don't for a second think the agency had any idea that the job or the client would be so bad. But this was a strategic young account person placed on a retail account. It was a totally wrong job for him and did not advance his career one iota. Careers are like fast trains. They can take a sudden curve going too fast and suddenly come off the tracks. And that is my issue with employee job referrals. I hear this story with some frequency. Why does this happen? Well, the referring account manager wanted her bonus. The HR person simply wanted the job filled. She was a contract recruiter whose performance was measured on how many jobs she could fill and how quickly. Beyond that there is very little quality control. Because this account executive had been working on this highly undesirable account, he became undesirable within the agency. They completely discounted his prior experience and refused to consider him for anything other than the most executional accounts. The irony is that this is a very well managed agency with excellent human resources. To use an analogy, the account person became known by the company he kept. There were two winners in this situation, the account manager who got paid an incentive encouraging to take a job he should never have been in. I have had many candidates tell me that they were duped by their friends. Their friends meant well and have nothing to lose by a wrongful recommendation. The other winner was the contract recruiter who was able to put a notch in her belt for filling the job. I actually like the idea of incentivizing employees to send appropriate candidates. But the issue is that contemporaries don’t necessarily know who among their friends is really appropriate. They aren't professional recruiters and usually have no vested interest in the people they send. And, it isn't like the agency sends out complete job specifications to employees. Beyond that, most of the people everyone knows are known either by reputation or as social contacts – the person in the office down the hall who you occasionally share a sandwich with. They don't know their strengths or weaknesses or their career objectives. Employee referrals should be given total scrutiny, including a determination of their relationship with the referred individual. This kind of recruiting by companies doesn’t really save money. While it may save some short term recruiter commission expenses, there is no quality control built into the system. Most in-house recruitment managers are evaluated on how quickly they fill jobs, not by the longevity of their referrals. I wonder how many companies have actually conducted a regression analysis to compare the longevity of internally referred candidates to those placed by a professional outside recruiter? Now, of course, the bean counters only look at the bottom line and see that they saved a fat recruitment fee. And a job got filled with some efficiency. No matter that the turnover rate may actually increase and the harm done to the account and agency morale may far outweigh the couple of thousand dollars saved by paying a fee internally. My advice to people who get referred to a friend's company: buyer beware. I am suddenly receiving a large percentage or résumés which are missing essential information – home address, zip codes, phone numbers, email and even jobs and education. Each of these missing elements could cost you an interview or a job. Let’s start with this premise. A résumé should contain all relevant information. The reader should have a complete look at the person whose paper they are reading. After someone looks at your résumé, they should be able to obtain a quick picture of who you are and what you might be able to contribute to their company. 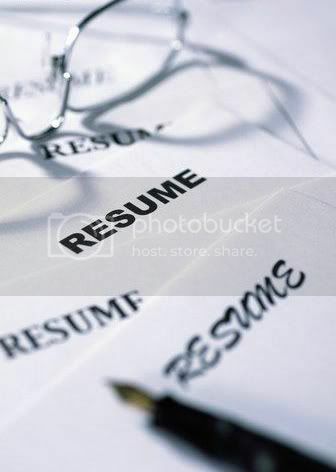 A résumé should make it easy for people who are interested in you to be able to find you and contact you. Remember, a résumé is an ad for yourself. But I see a lot of résumés which do not contain home addresses, zip codes, home phone numbers, colleges, degrees and graduation years. And, of course, people who are over forty or fifty tend to lop off jobs and their graduation dates. When these items are missing, despite whatever the reasons the résumé writer has, it may communicate negatively about you. At the least, it may communicate that you are bad on details. I fully understand why people, particularly women, are not putting their home addresses on their résumés. But it may be counterproductive. What one might save in security, one looses in incompleteness. If I get a job in New Jersey and there is no NJ address in the résumé, the candidate might lose out on a perfectly appropriate job because I didn’t know to call her. Every good recruiter or interviewer will ask for this information in an interview, but what if they forget? Many candidate leave zip codes off their résumé address. I ask about it and I am often told that it interfered with graphics and the format. This is a case of form over function, but your zip code is an essential element in your address. Omitting it, may communicate that you are not detail oriented and someone might reject your résumé based on this incomplete information. These days most calls are made to one’s cell. I get it. But there have been many times when I needed to speak to someone during the weekend and their mobile phone was turned off and either myself or a client needed to reach them. It isn't vital but it is a good thing to consider. Office numbers are rarely on résumés any more; they are not necessary because, if I want to reach someone at their office, I can always get the main number and call the company. Every professional interviewer can immediately tell when someone is trying to fudge their graduation year so people can’t tell their age. It is ridiculous. Like all recruiters, I can smell it a mile away. Leaving off that information is, to me, a sign of weakness and possibly insecurity. Besides, when graduation years are omitted, I automatically assume that early-career jobs are missing as well. Lopping off jobs is always evident. People don’t start their careers as vice presidents! And, besides, the experienced gained early in a career may be very relevant to current interviewing – and it certainly gives perspective to one’s background. Depending on one’s level, a catch-all paragraph listing previous experience may or may not be relevant. However, that experience may contain important information. Someone who is sales trained, worked on or at a great company like Procter or IBM should make sure that this information shows. These days, most recruiters use computers which contain all your information; single industry recruiters like myself can always tell when information is left off - sometimes candidates are in my data base for many years before I meet them. Something which happened in the way distant past may make you the perfect candidate for a current job. Putting Twitter, LinkedIn and Facebook logos on your resume is superfluous, at least for me. It is not important to know that someone tweets. I have observed that many LinkedIn profiles are out of synch with their resumes. Dates are often misstated on one or the other. Companies are often on one and not the other. A word to the wise: be careful. When you submit a resume to a job board and they do not respond, this could be one of the reasons. The whole purpose of a résumé to enable people to gain a complete snapshot of you and to make it simple for them to reach you. The information must be accurate and complete.